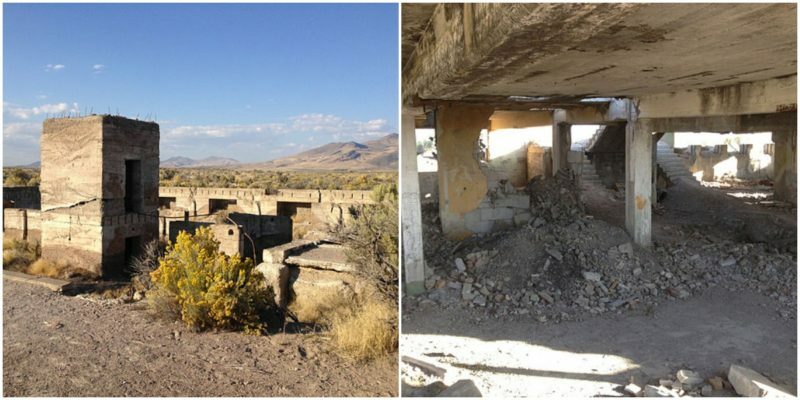 The abandoned town of Metropolis in Nevada is not famous as the town of Metropolis in Illinois, which was officially declared as the hometown of Superman in 1972 and now houses the museum of Superman. But although mostly in ruins and with only parts of two buildings left intact, it certainly has interesting stories to tell. The initial plan was for the settlement to be developed into a real metropolis — home to 7,500 people. Unfortunately a series of tragic events that seemed as if they came out of the Bible led to its fatal destruction. The ambitious hopes to raise an agricultural oasis in the harsh desert failed. Metropolis had a brief history as a town where people lived, worked, and loved, trying to conquer nature. It officially existed from 1911 until 1947, but by 1935 it was almost completely dead. 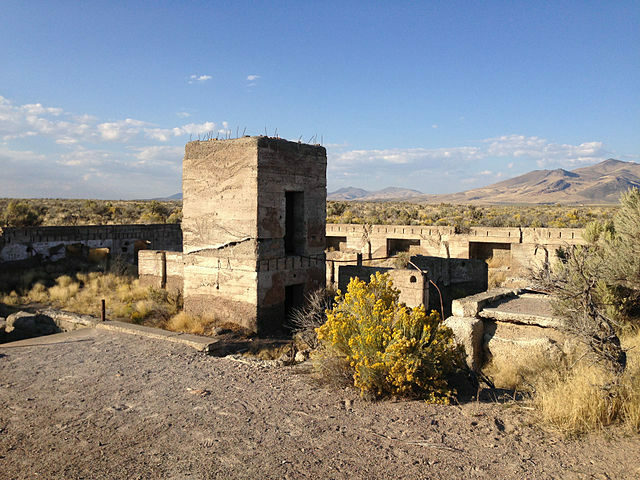 At its peak it had approximately 2,000 residents who were mostly Mormons. It had a school for 150 students, a magnificent hotel on three floors with 50 rooms, an amusement hall, a newspaper, a wagon factory, five saloons, and even electric lights and concrete sidewalks on its central street. There wasn’t a church, because the Mormon congregation used the amusement hall as a meetinghouse. 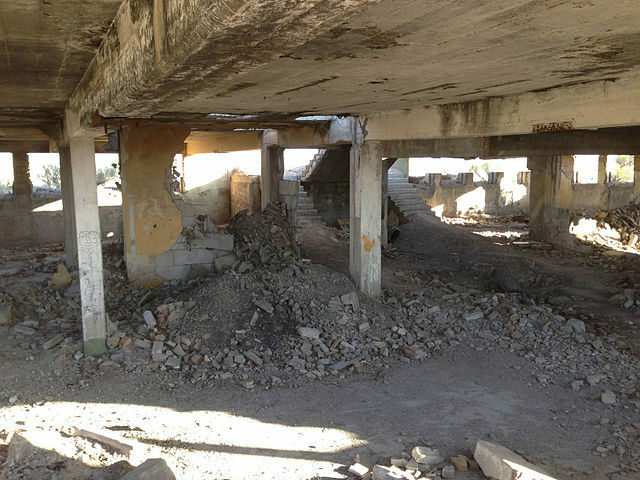 Today there is not much left from the former glory of the town. 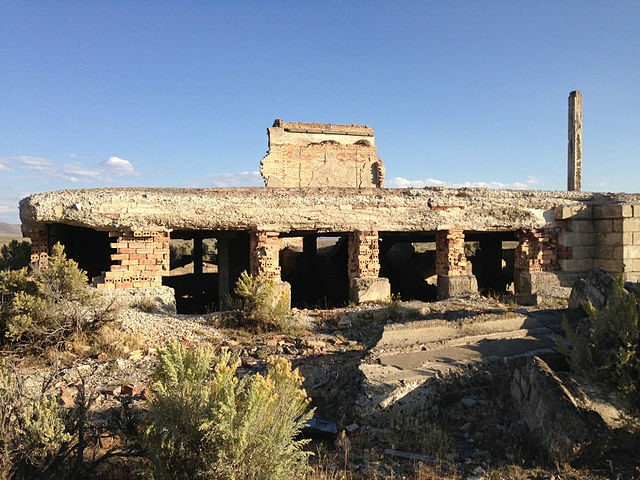 It is the only agricultural ghost town in Nevada, the others were mining boom towns that had a sudden start and sudden end. 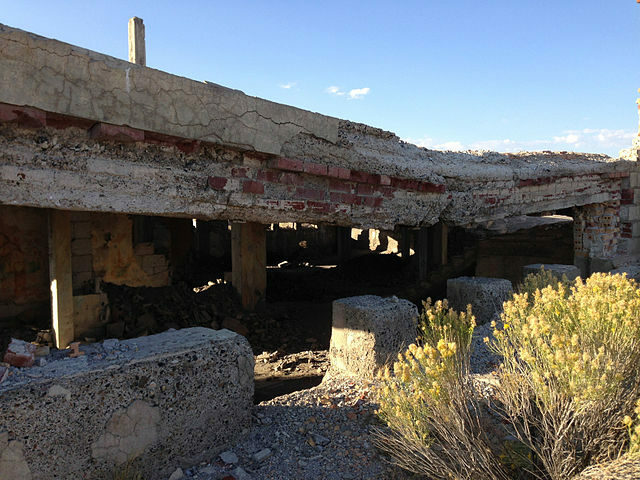 It is an interesting fact too, that instead of the rotting wooden buildings that can be found in the most of the ghost towns of the Old West, the remains of Metropolis are mainly composed of concrete and some parts of them still stand proudly. However they are in a serious state of decay and entering them is a quite risky task. 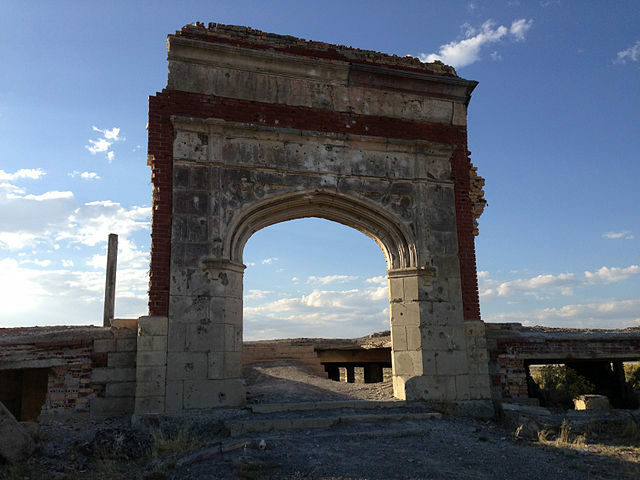 On the former Main Street (now only a deserted dust road) the crumbling remains of Lincoln School can be seen, alongside the ruins of the Hotel Metropolis and Valley View cemetery. Probably the most characteristic feature of Metropolis is the breathtaking entrance arch of the school that still stands in its full glory. But the rest of the school building is reduced almost to its foundations. The roof of the basement is collapsing, as well the surviving walls. In the small cemetery are placed the graves of several generations of the town’s families. Their descendants still owns ranches in the area and the grave site is fenced and well maintained. The rest of the town is reduced to piles of rubble that are overgrown by the desert vegetation, mostly sagebrush. 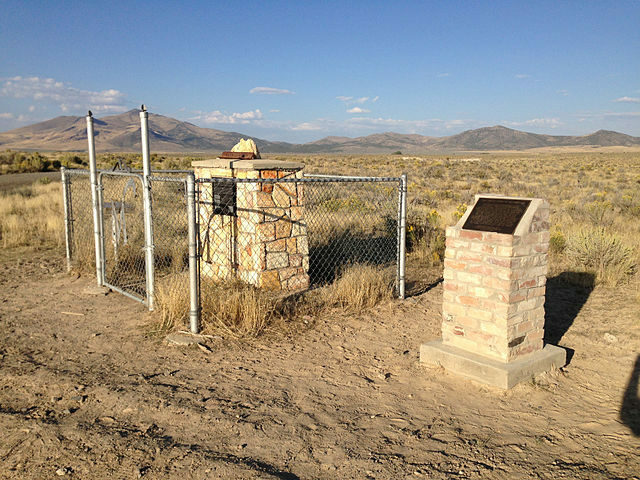 There is also a stone memorial built in 2013 in honor of the town and its former residents who lost the battle with the harsh climate and the difficult conditions of the desert. According the memorial words of the historic plaque, the town died from thirst. But the constant lack of water brought a series of other tragedies that bring to mind the ten biblical plagues sent by God on Egypt. 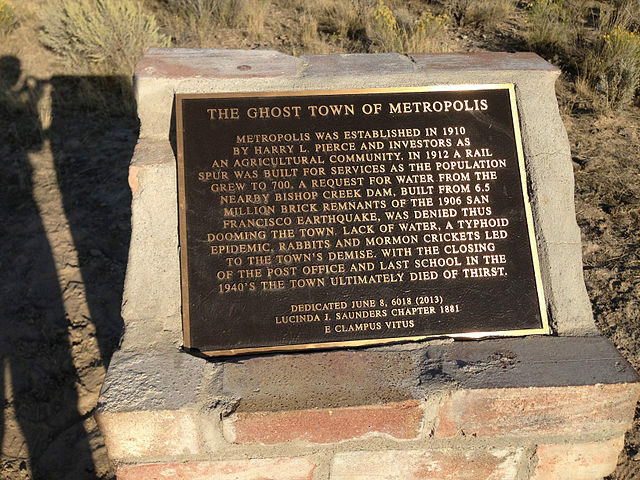 Metropolis was built as a planned town in 1910 by Harry L. Pierce (president of the Pacific Reclamation Company from New York) and other investors as an agricultural settlement. It was meant to be the center of a huge farming area. 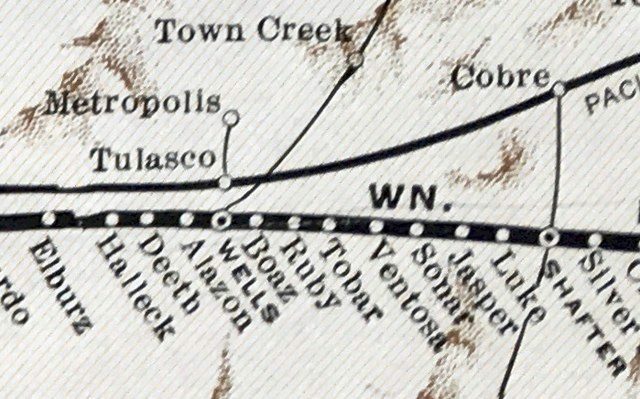 In 1912 the population grew to 700 and a rail spur was constructed for their everyday needs. However, the investors made wrong calculations regarding the quantities of water needed for the farm fields. The investors constructed a dam — from 6.5 million bricks that were collected after the 1906 San Francisco earthquake — on the nearby Bishop Creek. But this project started a legal battle between the towns of Metropolis and Lovelock over water rights. The request for water from the Bishop Creek Dam for Metropolis was denied. Metropolis lost in the courtroom, and without water that also meant that sooner or later it would lose the battle with the hot desert and would cease to exist. The inevitable end of Metropolis was near. The people tried dry-farming, but after a few years they saw that it didn’t work. The constant drought was bad for the crops, but that wasn’t the only problem. In the winter 1915-1916 a typhoid fever epidemic hit the community and many died. Also, because of the organized extermination of the coyotes, the number of jackrabbits rapidly increased and they devoured the already sparse crops. The final straw for the farmers was the invasion by a millions of Mormon crickets that swarmed through the fields, ravenously eating anything they could find. In 1936 a devastating fire hit the town in which the hotel and the amusement hall were burned to the ground. These apocalyptic events led to the town’s demise. The population decreased and the town was almost completely empty when the post office closed in 1942, and the school in 1947. For nearly 80 years its remains have stood as a monument of people’s efforts to conquer the unconquerable nature.